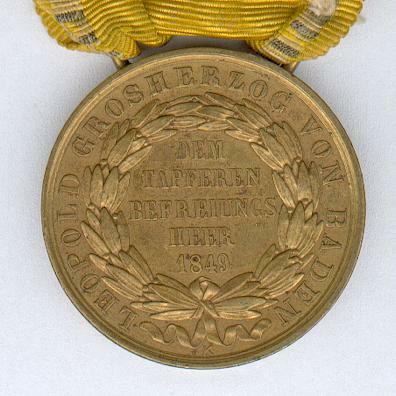 Circular light bronze medal with bar for ribbon suspension; the face inscribed ‘DEM TAPFEREN BEFREIUNGS HEER 1849’ (the Brave Army of Liberation 1849) within a laurel wreath, circumscribed ‘LEOPOLD GROSHERZOG VON BADEN (Leopold Grand Duke of Baden), maker’s mark ‘K’ (for Kachel) at the base; the reverse with an upright broadsword encircled by two palm branches; on possibly original tired grubby ribbon. 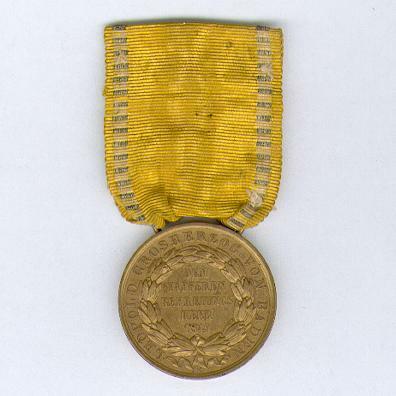 The Medal was instituted by Grand Duke Leopold on 9 August 1849 and awarded to ‘all those who participated reproachlessly in the recent 1849 campaign against the insurgents (‘für alle diejenigen, welche den letzten Feldzug 1849 gegen die Rebellen in Baden tadellos mitgemacht’). 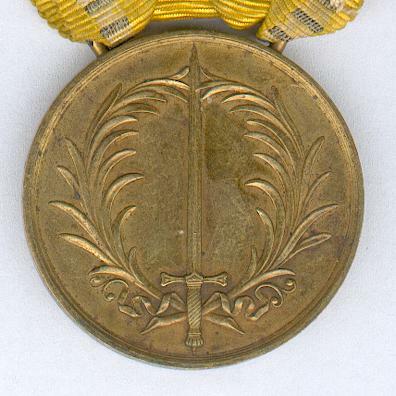 Baden, though increasingly prosperous, was not immune to the revolutionary fervour that swept Europe in 1848-1849. Armed insurrection broke out in both years, made more serious by the sympathy of much of the army to the insurgent cause. 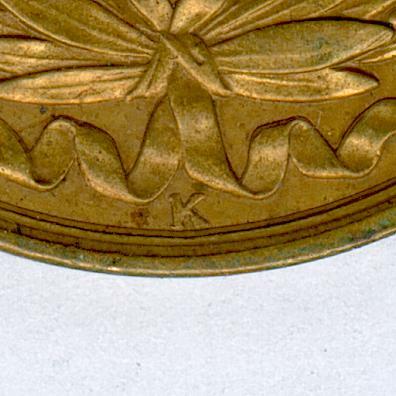 Matters came to a head in May and June of 1849, the Grand Duke and his government being obliged to flee the capital, Karlsruhe. At this point, Leopold requested the intervention of Prussia whose forces routed the rebels at Waghausel on 20 June. Leopold returned to Karlsruhe on 10 August and Prussian forces remained in Baden until order had been restored.